Pack the 18th (Mon) with family-friendly diversions at Discovery Cove. Have a day of magic on the 17th (Sun) at Walt Disney World Resort. There's more to do: make an unforgettable trip to Happily Ever After Fireworks and admire the masterpieces at Charles Hosmer Morse Museum of American Art. To see ratings, photos, reviews, and tourist information, use the Orlando tour builder app . Cincinnati to Orlando is an approximately 5-hour flight. You can also drive; or take a bus. Traveling from Cincinnati in March, expect Orlando to be warmer, temps between 78°F and 58°F. Finish your sightseeing early on the 18th (Mon) to allow enough time to drive to Miami Beach. Kick off your visit on the 19th (Tue): wander the streets of Collins Avenue, then wander the streets of Lincoln Road, then get a taste of the local shopping with Aventura Mall, and finally look for gifts at Perfect Gifts South Beach. Get ready for a full day of sightseeing on the 20th (Wed): browse the different shops at Village of Merrick Park, buy something for everyone on your list at Dolphin Mall, then don't miss a visit to Bayside Marketplace, then get to know the fascinating history of Art Deco Historic District, and finally tour the pleasant surroundings at South Beach. For reviews, photos, other places to visit, and tourist information, go to the Miami Beach itinerary planner . Traveling by car from Orlando to Miami Beach takes 4 hours. Alternatively, you can take a bus; or take a train. Traveling from Orlando in March, expect a bit warmer with lows of 65°F in Miami Beach. Wrap up your sightseeing on the 20th (Wed) early enough to drive to Big Pine Key. Big Pine Key is a census-designated place and unincorporated community in Monroe County, Florida, United States, on an island of the same name in the Florida Keys. On the 21st (Thu), look for gifts at Out of the Blue Gallery, identify plant and animal life at National Key Deer Refuge, and then immerse yourself in nature at Bahia Honda State Park. To see photos, maps, reviews, and more tourist information, go to the Big Pine Key online trip itinerary maker . Getting from Miami Beach to Big Pine Key by car takes about 3 hours. Other options: fly; or take a bus. In March, daytime highs in Big Pine Key are 81°F, while nighttime lows are 69°F. Cap off your sightseeing on the 21st (Thu) early enough to catcht the bus to Key West. On the 22nd (Fri), view the masterpieces at Alan S. Maltz Gallery, look for all kinds of wild species at Key West Butterfly & Nature Conservatory, then see the interesting displays at The Ernest Hemingway Home and Museum, then stop by Key West Treasure Chest, and finally get a taste of the local shopping with 7 Artists & Friends. 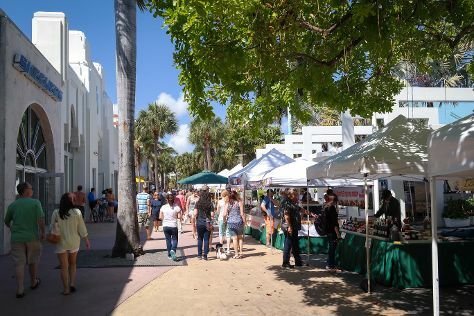 Keep things going the next day: immerse yourself in nature at Fort Zachary Taylor, take an in-depth tour of Truman Little White House, and then browse the eclectic array of goods at Sunset Celebration. For where to stay, other places to visit, and other tourist information, read Key West trip planning tool . Getting from Big Pine Key to Key West by bus takes about an hour. Other options: drive. In March, daily temperatures in Key West can reach 79°F, while at night they dip to 69°F. Finish your sightseeing early on the 23rd (Sat) to allow enough time to travel back home.